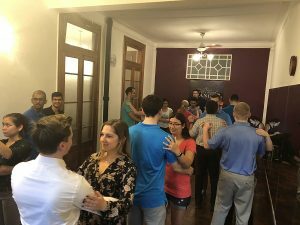 While we have spent most of our time between site visits and lectures, we’ve been able to enjoy the Argentinian culture as well. 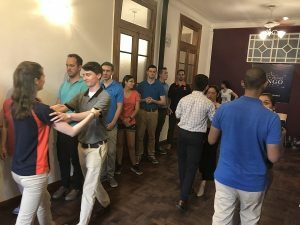 On Thursday, we ended the day’s visits with a fun activity — a Tango lesson. Argentina is the birthplace of Tango, a popular dance well-known for its intimate style. 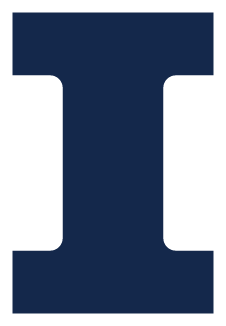 It was created in the late 1800s but didn’t gain worldwide popularity until around 1915. Our instructor, Maria, has been teaching tango for 13 years; her experience shows when she dances! She seemed to move flawlessly across the floor. At first, we were not as graceful. As previously mentioned, the Tango is an intimate dance. A successful execution of this dance relies on the use of body language. Traditionally, the male partner leads the woman. She should be able to follow his moves without knowing them before hand, simply based on the man’s guidance and the strength of their connection. Maria had lots of patience with our large group and was able to help us all individually with our different mistakes. Many of the difficulties arose due to having such a large group in such a small studio, while others were related to many of our’s lack of coordination. After an hour and a half of dancing the Tango, we were sweating more than we had all day — and it was a high of 97 degrees! 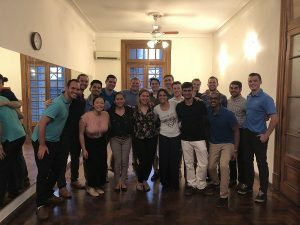 Although many of us stepped outside of our comfort zones, all of us really enjoyed our experience and were glad to have had the opportunity to learn this dance in its home country. 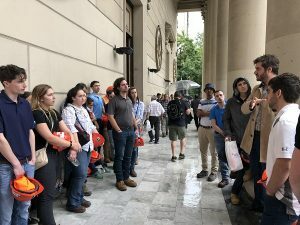 On Friday, we were able to squeeze in a walking tour of Downtown Buenos Aires between an already packed schedule. Our tour began at the cathedral in Plaza Mayor, which is located near the famous Casa Rosada. In English that translates to “The Pink House” and is Argentina’s equivalent to the White House. Our tour guide, Juan, gave us an overview of some of the surrounding buildings and how the city center has transformed over the years. Most of the buildings in the plaza are government buildings. If they are not currently used for government purposes, they were originally built for that purpose. 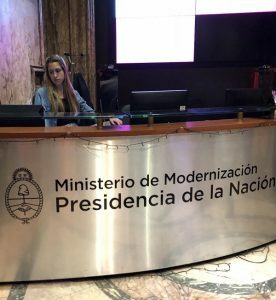 Changes to government structure and implementation of new policies enacted a relocation of some of the offices from the city center to the Buenos Aires Province. The plaza in the city center is the location for many protests in Buenos Aires and tend to happen quite frequently. The plaza is also visited often by tourists and of course the officials who work within it. Being at the center of the city, the plaza is also a crossroad of pedestrian and vehicular traffic, making it one hectic location. According to our guide, the plaza hit a true low-point of safety around five years ago. The plaza was dangerous and was causing many problems to the city. At that point, the city committed to making changes that would promote a safer environment. Some of these changes include better sidewalks, a reduction of exposed mechanical objects, and the prohibition of private vehicular traffic through the plaza. The plaza is much safer now and the people of Buenos Aires are very pleased. On our tour, Juan took us to the building where he works to show us a great view of the city — from the roof! 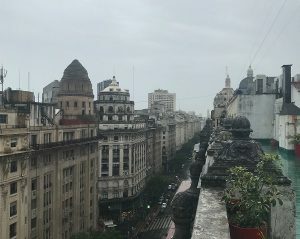 It was an awesome perspective to see 360-degree views of Buenos Aires. Our tour came to a close just outside of the city center where Juan was describing the different architectural styles within the district. Unfortunately for us, due to weather conditions (a downpour of rain), the tour became limited and therefore we did not visit quite as many landmarks as we had hoped. Fortunately, the rain cleared up in enough time for us to get to our next site visit of the day on time, though!